"For consumers, the downfall of Borders is glorious, much as was its climb to success. In the rearrangement of resources to serve customers we see the beautiful actions of the market economy reconfiguring the world to provide the goods and services that are most wanted and needed in the most effective way. To ignore the upside to Borders’ downfall is as fallacious as to focus only on the downside of its upswing, as did most of the anti-corporate left in the last decade. But today we see that it was not government, nor socialist agitation, that brought the axe down on this big company. It was the matrix of demand provided by customers. It was the consumer base, acting in a manner much more democratic in the good sense of the word, and much more peaceful and socially productive, than anything we see in the political process. Thank goodness there is no doctrine of “too big to fail” in the book store industries. If the government bailed out Borders as it has so many financial institutions, surely the customers would suffer. The failure of Borders is a beautiful thing, coming as it does from the market process. If voluntary competition should one day bring Amazon.com down, in the midst of a competing commercial success today unimaginable but even more friendly to consumers than that wonderful online store, we will again have reason to celebrate." MP: A reminder that capitalism operates by a "profit and LOSS" system. I am looking forward to the time when we can see the ethanol producers, solar panel manufacturers, wind power producers, etc., also be allowed to fail because, just like Borders, they could not compete in an unhampered market. "Many investors are optimistic about the company's use of the "clicks and mortar" strategy, in which walk-in customers use a Borders intranet site to search for titles and order books once they are in the store. Borders partisans say this combination of traditional and online retailing may help the company sidestep online price wars." The "clicks and mortar" intranet strategy made money for a few years. What if Borders had pursued the more expansive internet strategy? Could have, and should have in 1999. The failure of Borders also acts as a symbol of how many local retail companies do not understand how to leverage their strengths in a global, technologically networked world. Borders has many potential advantages over Amazon in addition to local inventory that markets traditionally value. They took advantage of none of them. The failure of large companies is always a fascinating story of bureaucratic inertia, a near total denial of changing markets, along with an inability to alter their business practice to add value. As a turnaround specialist, I suggest it is not ideology that is the most effective argument against large and invading government. It is the very practical inefficiency and inherent statism of any large bureaucracy. If a large bookstore chain can not survive the Internet without even using all the quivers in their bow, how can educated people even begin to believe they can regulate all of health care from Washington? The whole idea is in practice beyond silly. If ”capitalism operates by a ‘profit and LOSS’ system” why are the big banks and alternative energy producers still in business? It seems that capitalism is for the political outs while the well connected get socialism in the form of taxpayer protection when they fail in the marketplace. How many times are banks going to fail before capitalism is allowed to send them after Borders? "The "clicks and mortar" intranet strategy made money for a few years. What if Borders had pursued the more expansive internet strategy? Could have, and should have in 1999." If you recall, in 1999 Amazon was constantly on the brink of having their lights turned off as they searched for new financing quarter after quarter, and in fact, didn't make a dime in profit between 1995 and 2001. An incredibly long time in the dot-com era. 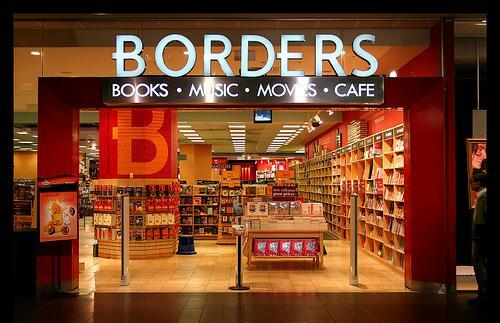 Borders, on the other hand, had a successful, growing business. I'm sure they saw no reason to venture into what seemed like the great unknown. "If ”capitalism operates by a ‘profit and LOSS’ system” why are the big banks and alternative energy producers still in business?" That's a good question: Of course, we know 'why', but not 'why', if that makes sense. Government interference in the market is the obvious why. Mercantillists who are politically connected get private profits and public losses. But, IIRC, you call for that kind of favoritism yourself in the the form of tariffs on imports. Ron H, "Yeah, hindsight is great, ain't it? :)"
Yeah, I went to a presentation by Amazon CEO Jeff Bezos at the Univeristy Of Washington in about 1999. Jeff told us of the computing power his company had and also wanted. He needed investors for the long term since it was a chronic money loser. I did not buy into his excitement nor AMZN stock. Oh well. But, IIRC, you call for that kind of favoritism yourself in the form of tariffs on imports. I argue that free trade, as it is practiced in the real world as opposed to theory, is just another way that government favors well connected companies (multi-nationals) over the general welfare. "I argue that free trade, as it is practiced in the real world as opposed to theory, is just another way that government favors well connected companies (multi-nationals) over the general welfare." You are describing crony-capitalism, not free trade. If trade is restricted or regulated by government, it isn't actually free. "...government favors well connected companies over general welfare" also describes the effect of tariffs. Consumers should be free to choose who they buy from. You argue for managed trade. Vange Ike in favor of eliminkating tax breaks to oil and coal and natural gas. I would eliminate all direct subsidies to all companies. But I would also eliminate corporate taxes. "I would eliminate all direct subsidies to all companies. But I would also eliminate corporate taxes." "But, But," sputters Hydra, "How will we be able to finance the enormous amount of government regulation required to keep the free market from running off the rails?"